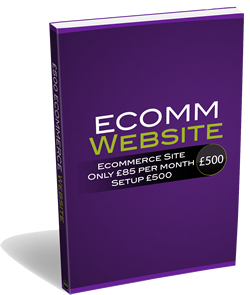 If you have products or services that you want to sell on the internet, you will need an e-commerce website solution. Depending on the size of your catalog and number of anticipated sales, we will recommend an eCommerce solution that fits your business. Because selling your wares on the internet is a very hands on experience, we will offer training after the e-Commerce website is completed. Once you see how easy it is to put your products online, you will be trading like a pro in no time and remember we are on hand at all times with help. 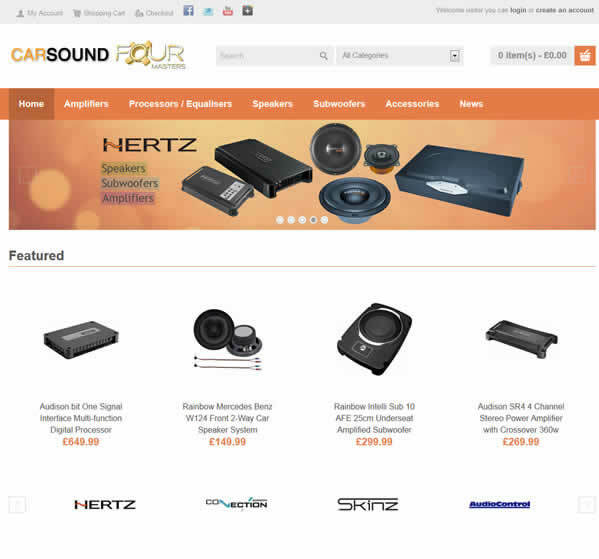 One of our own e-Commerce sites (Example below) currently uses OpenCart although we have experience with Magento and other eCommerce shopping cart software packages some of which can also integrate with your accounts and inventory packages. You will notice this website also has full social media integration and additional blog site as well as email newsletter forms. This one has the lot! 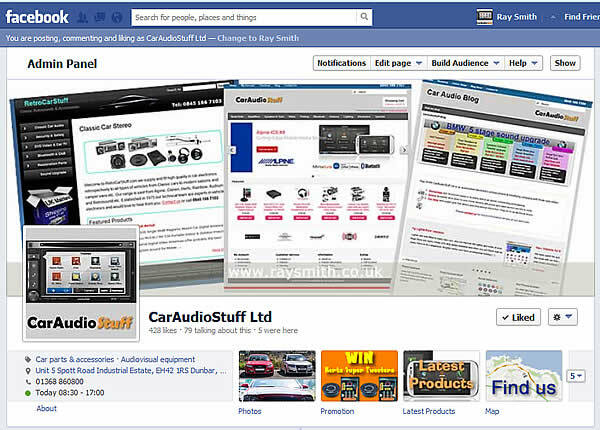 www.caraudiostuff.co.uk is a very successful eCommerce website that is mature and has been earning income on its 500 plus product range for several years. This site has been through three major changes and upgrades from Magento to Opencart with WordPress blog pages and social media integration it has a healthy Facebook and Twitter following. 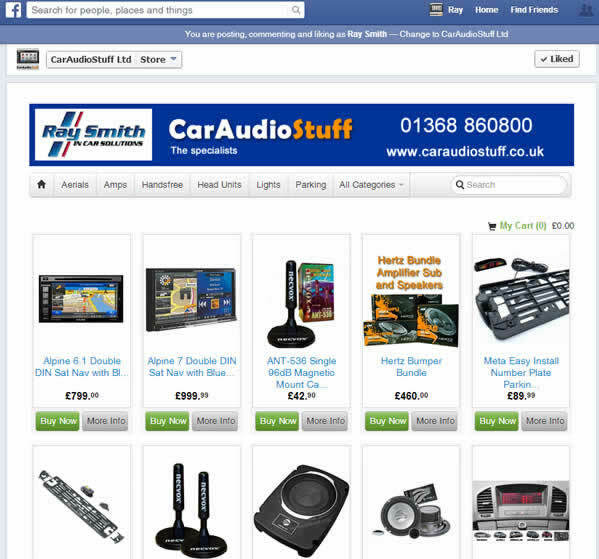 You could have an e-Commerce site like this for only £500 & easy monthly payments of £80 for two years. It will pay for itself many times over. e-commerce stores, Ray Smith Specialty! Two seconds. That’s all the time eCommerce store owners have. The design of your eCommerce site has to be visually appealing at the very first glance. In other words, your e commerce store has to capture visitors right off the bat, and in order to do that, its design has to be nothing short of spectacular, visuals-wise. Once you have captured them you need to convince them that your products are worth buying and instill trust that their payment will be secure and delivery assured. The objective here is to gain your visitors’ trust and to utilize a layout and design that’s easy to use and highly reliable. At Ray Smith Marketing, we offer a number of premium store development services at highly competitive rates. We favor OpenCart Shopping Cart Solution designed feature rich, easy to use, search engine friendly and with a visually appealing interface. We create stores that look highly professional and beautifully designed and that will inspire absolute confidence in your customers. We can help you to add features to your store too; there are so many plug-ins which can add functionality we can’t list them here however please contact us if you are interested and we will be happy to elaborate. If you hope to encourage sales then you need a site that reassures your customers when they’re entering their card details. The single most important factor is reliability and trust. If your site doesn’t look perfectly professional, then they will often simply look elsewhere. Any eCommerce site with promotions and deals should advertise them front and center, such as in the homepage slider or in the header. A pop-up sign up form for newsletters can also help with conversions. You can encourage more sales of an item simply by carefully choosing which item you position it next to and what color you make your ‘buy’ button.